Updating an Outdoor Space and Making it Better For Entertaining! 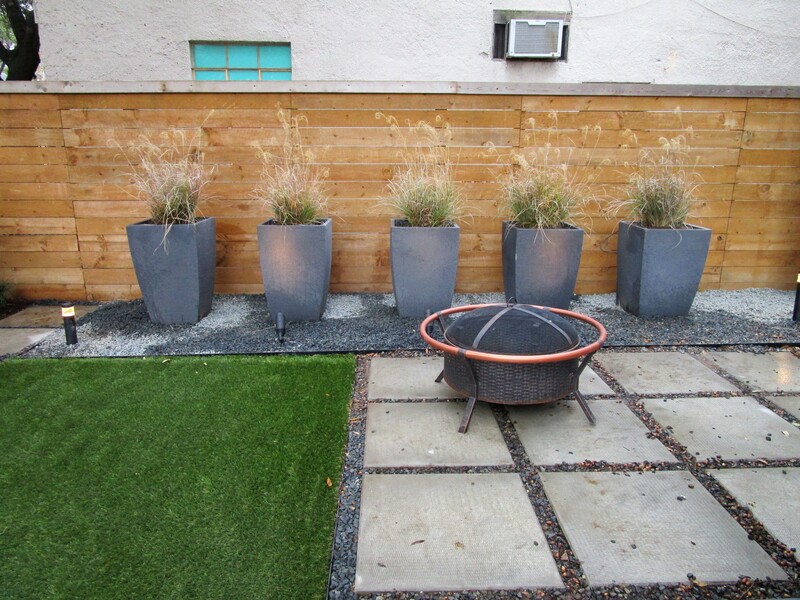 The yard of this Heights town home is a nice size and had been landscaped several years back. It had good bones. The biggest issue was shade from large oak trees along Yale Blvd. which made it hard to grow lawn. In talking to the owner we found the space wasn’t functioning the way she had hoped. 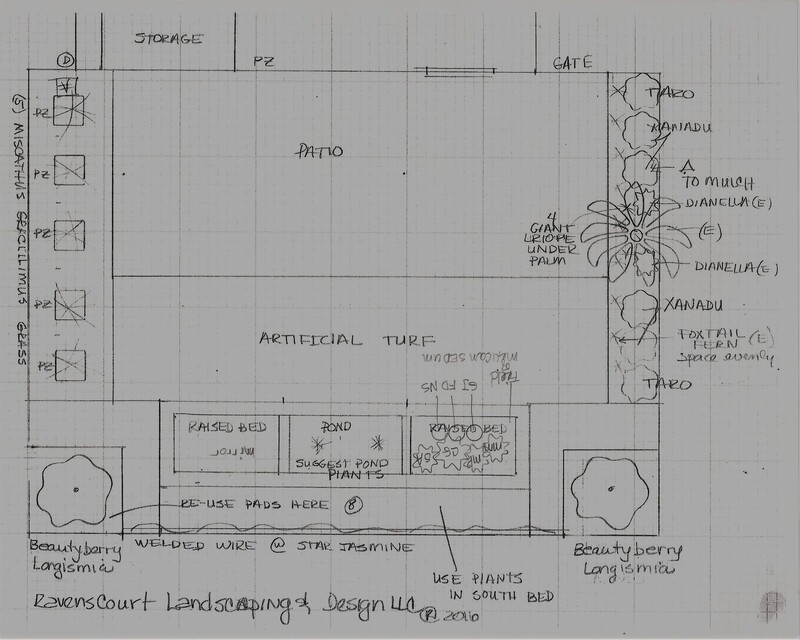 The lawn was often a mud pit and she wondered about changing it to artificial turf. We felt this was a good solution. 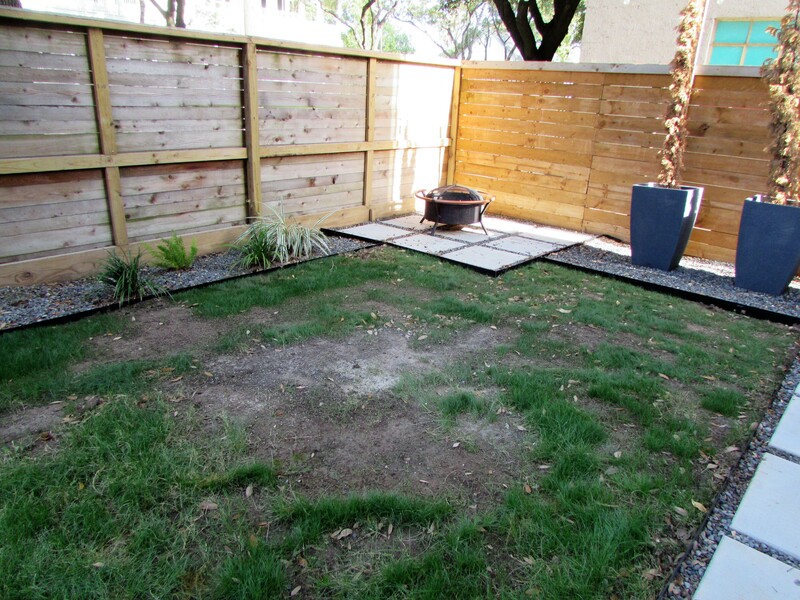 We started by removing the existing grass and installing DG (decomposed granite) as a base and compacting it. 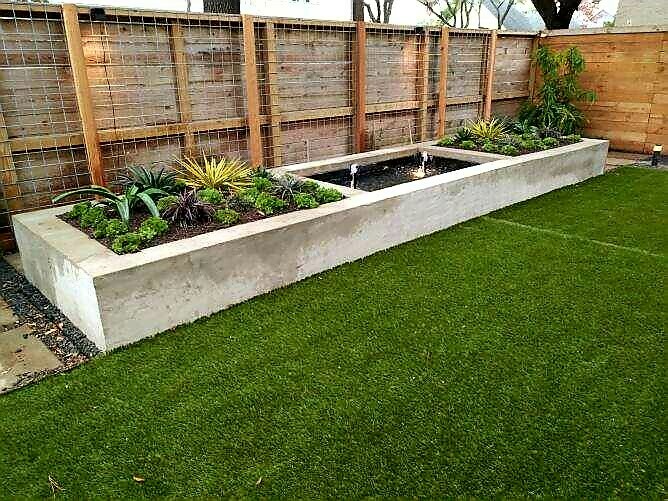 The fact that artificial turf is on a firm base means it can function like a patio. In talking to the owner we also found the space wasn’t functioning the way she had hoped. She wanted to use the space to do more entertaining and to enjoy in the evening after work and on weekends. 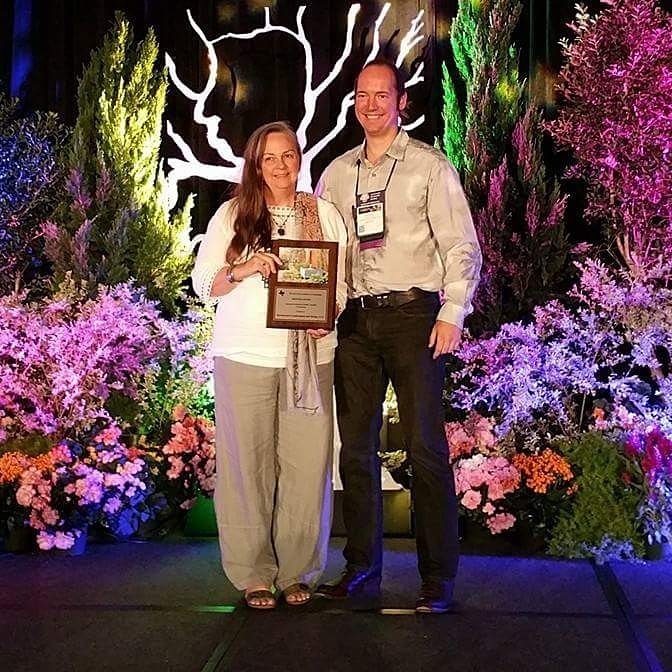 She wanted tropicals and a place to grow succulents. We talked about fountains and a focal point to distract from the busy street. Designing is about working within parameters. The clients’ needs and desires. The existing condition of the space. The architecture of the home. 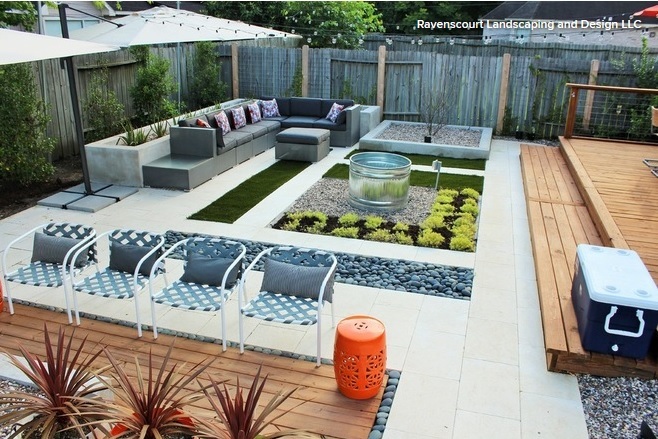 The style of garden that appeals to the client. The way the space will be used. The sun or shade conditions. Considerations like street noise and privacy. 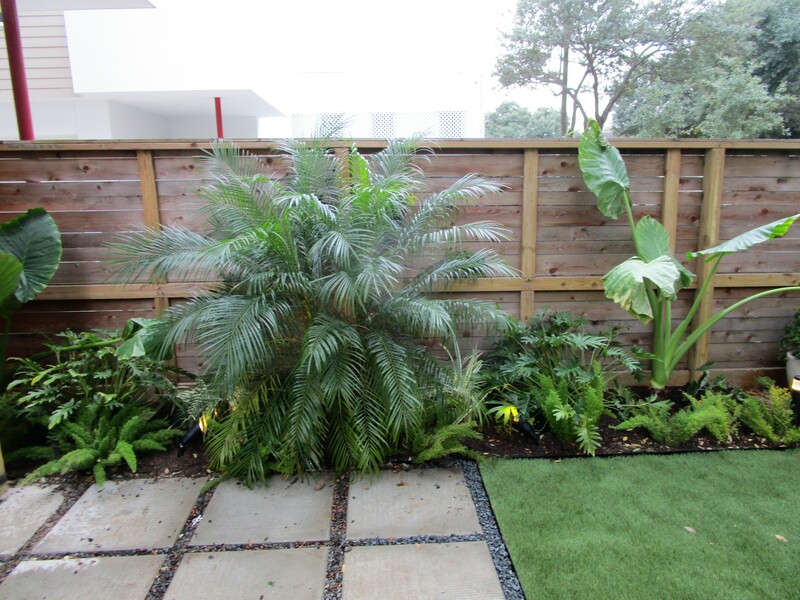 The palm in the picture below was already here sharing the bed with a few Foxtail fern. We added Xanadu philodendrons and Alocasia, Elephant Ear Taro. This gave the bed a much more tropical feel. The Alocasias and Xandu can freeze to the ground but they are both root hardy here in Houston. Otherwise these are easy to care for plants that love our hot humid summers. 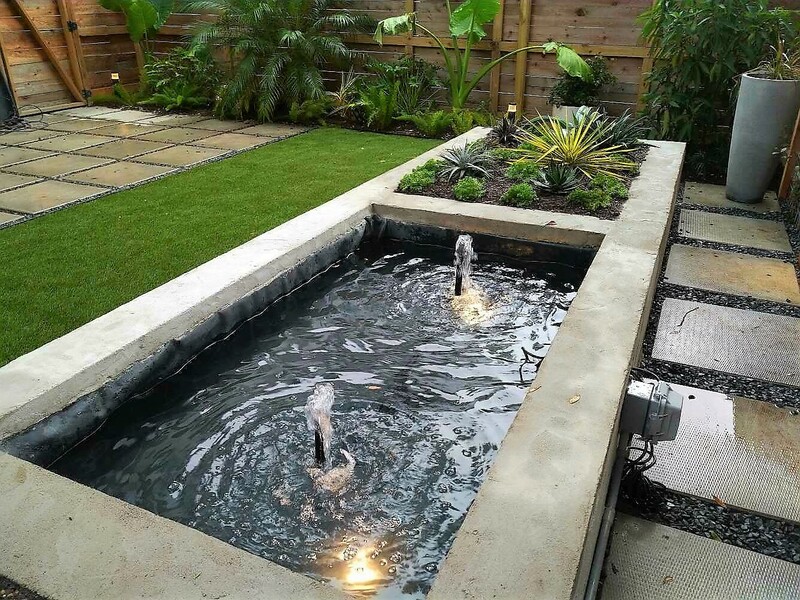 We presented a plan changing the use of some of the existing cement pads and creating a different flow with a large raised bed as a focal point. This is a copy of the first working plan. Originally we were going to use the existing string lights and rehang them. The client then asked about low voltage lighting. This took the look of the space up a notch and makes it more inviting and usable for evening entertaining. There are even low voltage lights inside the pond. We try and find the least noticeable place to add an electrical outlet. 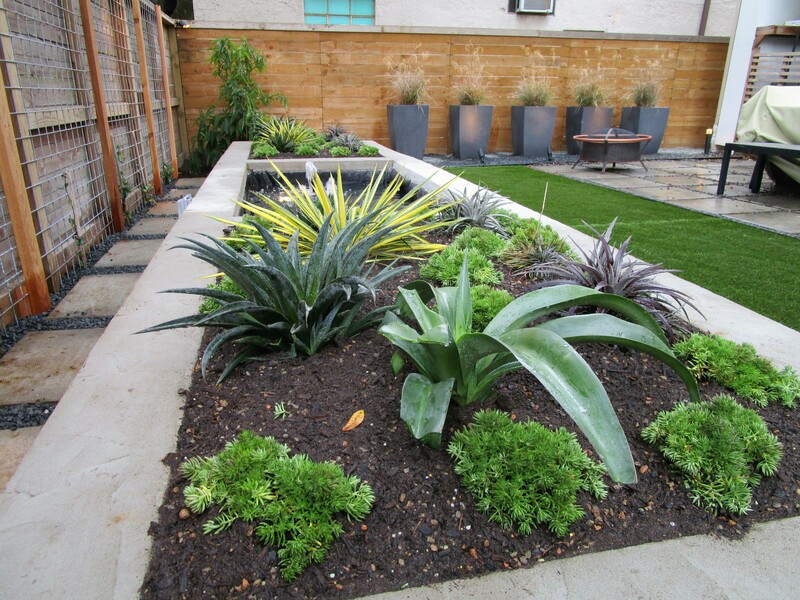 One of the reasons for the raised bed was to create a place for succulents that do well in our heat but really need good drainage. 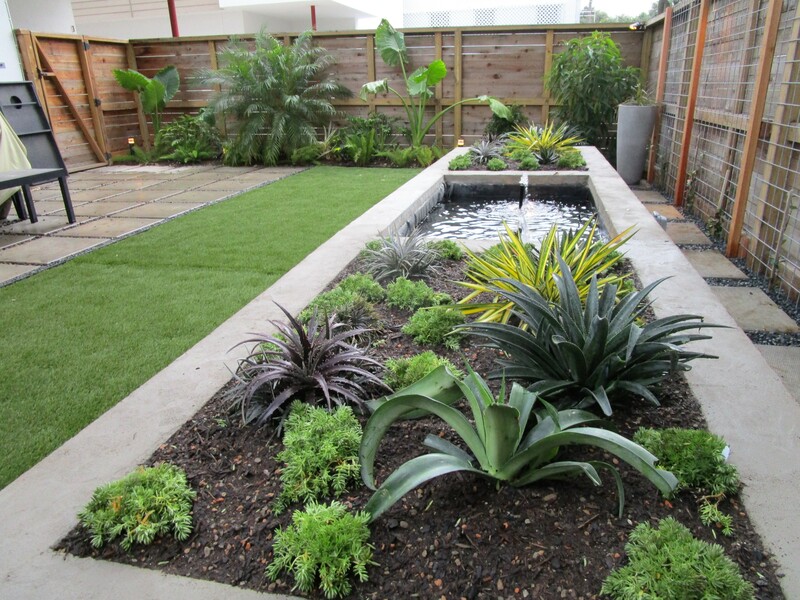 I then designed a pond in between to created a focal point. The sound is soothing and will help mask the street noise. 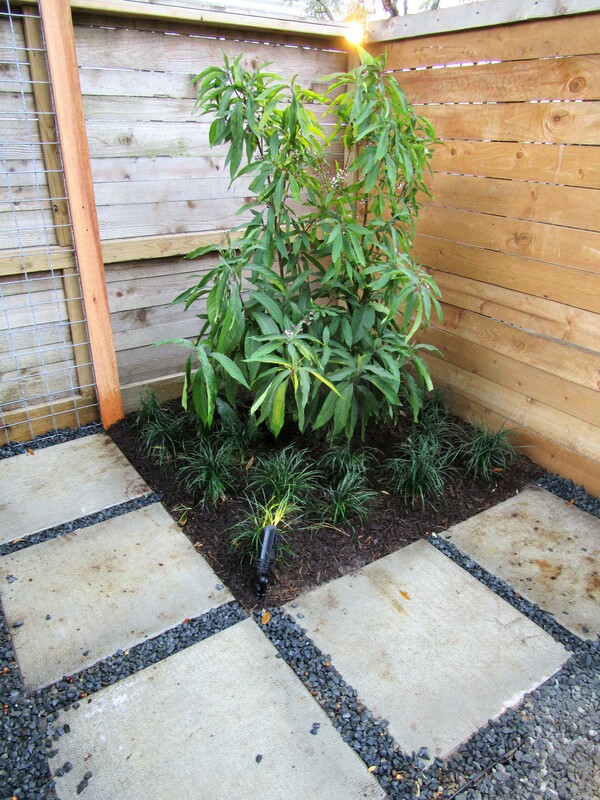 Star Jasmine is planted at the base of the welded wire trellis that we attached to the fence. Once it grows up and fills in it will create a green wall that will make a nice back drop to the fountain and help buffer the street noise. In the raised bed we planted a mix of succulents. This is the view looking south. You may notice the line across the artificial turf; there was a fold in the material, that we did not notice, when we accepted shipment. We tried to get it to pop back up but in the end we replaced the entire lawn. We found all these lovely succulents at Creekside Nursery. 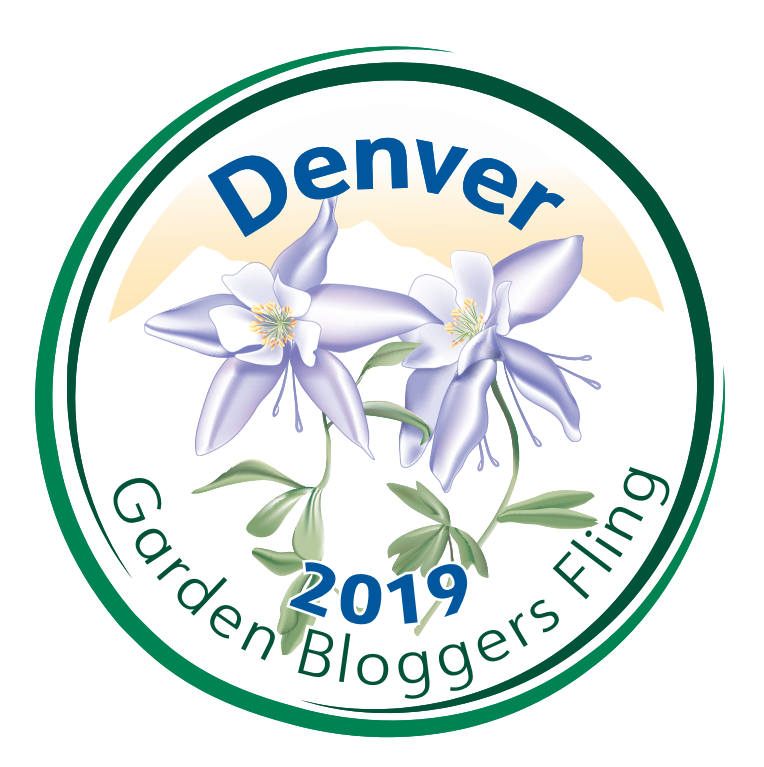 We have Mangave Macho Mochas, Mangave Pineapple Express PPAF, Yucca filamentosa ‘Color Guard’, Splendida agave, Grape Jelly dyckia, Dyckia choristaminea ‘Frazzle Dazzle’, Dyckia ‘Nickel Sliver’ and a border of Mexican sedum to fill in. We instructed the owner to cover these beds if we had any chance of a freeze. The seem to come through fairly well in spite of our all-night temp of 23 degrees in January. The two corners originally were meant to be patios. We took up some of the cement pads to create beds where we planted Beautyberry Longismia. 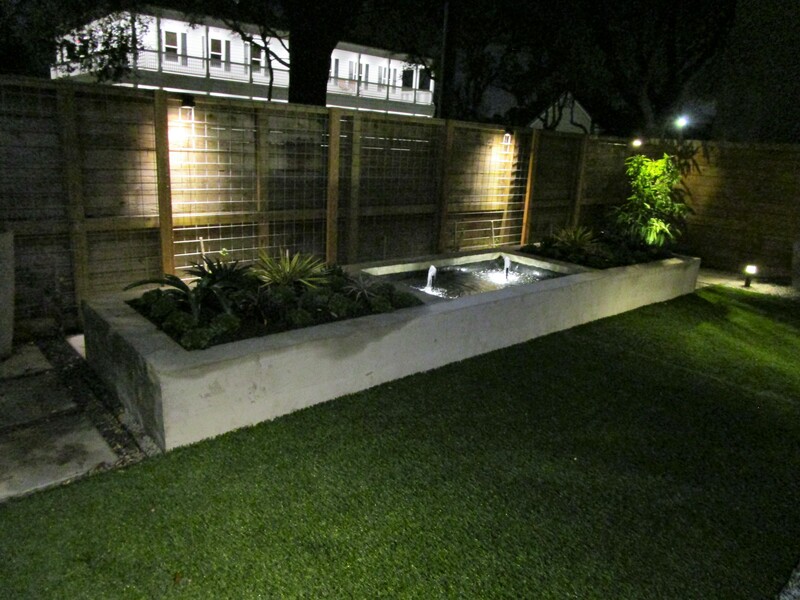 This photo shows the uplight in the front and the down-light mounted on the fence. These large shrubs have wonderful seasonal interest. 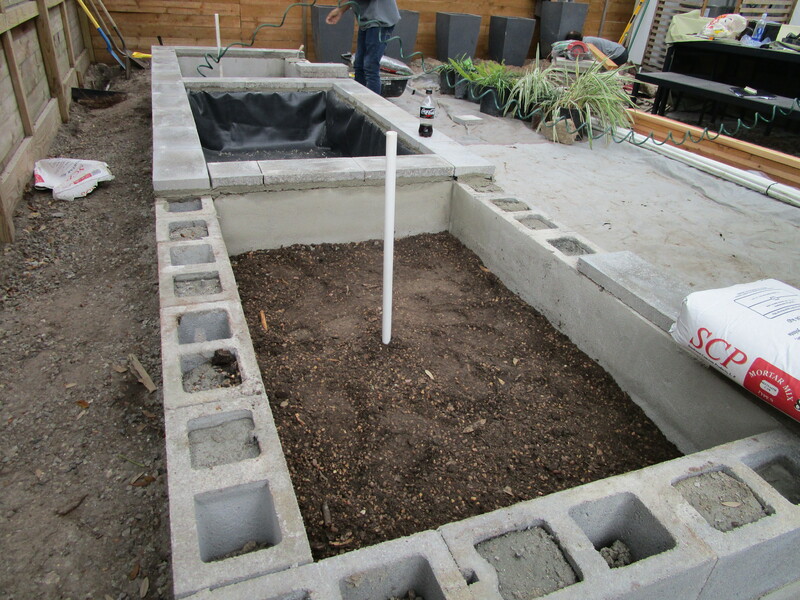 As we step back you can see that the raised bed is seating height about 16 inches. This makes it easier to tend. It can also be a place to perch during a gathering. The five large planters at to the north were not draining well and the Italian cypress from the previous installation had died. 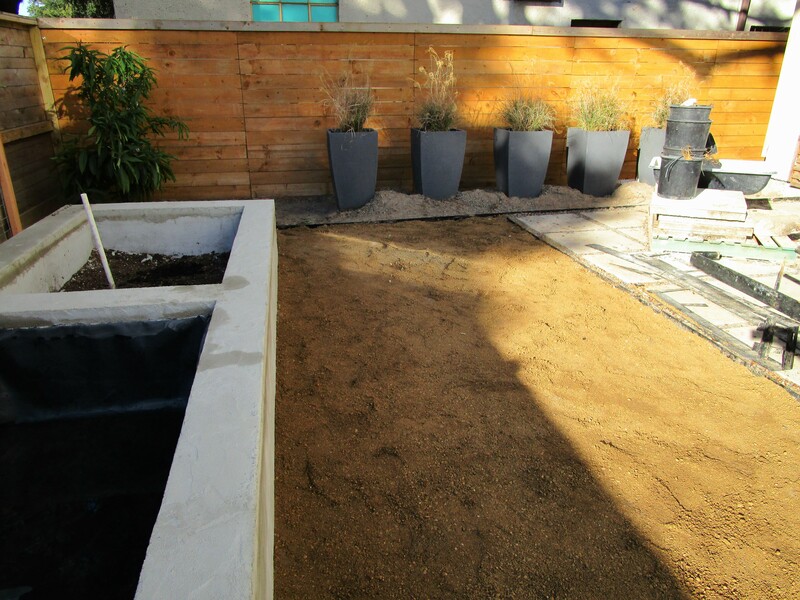 We made sure they drained and added micro-spray irrigation. The idea of creating a tall screen was good but I decided to put in Miscanthus Gracillimus grass. It will not block the view but it will fill in nicely and create movement and seasonal interest. I am hoping it will keep your visual interest inside the space. 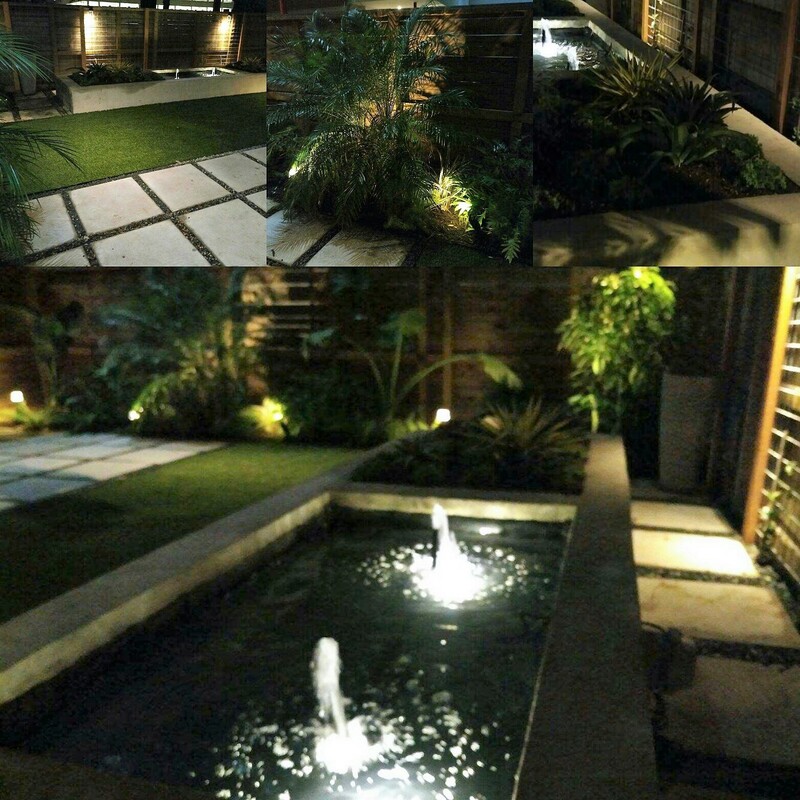 This is a collage I did for Instagram to show the garden at night. The over all feel is exotic and relaxing! Do you agree? Thank you rickii. I hear its already enjoyed a party! 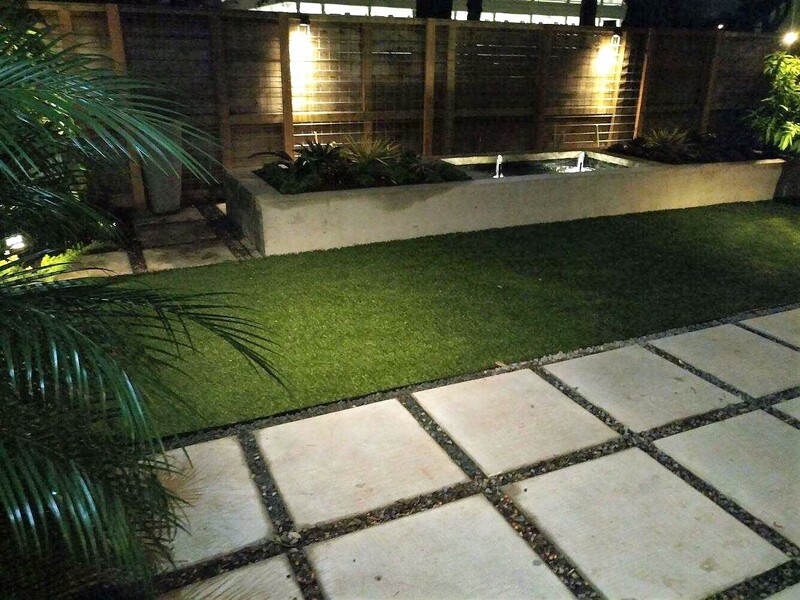 Love the fountain and raised beds, and that landscape lighting makes all the difference! Oh I really love the changes, this is a great space now! Thank you! I was thinking of you ehen I planted all the spiky plants. I wonder if Mangaves work in Portland. They have the coolest leaf colors. They are not as tough as agaves I have found. Beautiful job. I love the fountain (of course!) and the proportions of each piece to the whole is very pleasing. I have learned to not be afraid to do something like the big raised bed…the elevation and size command attention which helps take your focus off the traffic noise, of course you can hear that in pictures. Great project! I love that landscape lighting. Great ideas. loved to find out new lighting landscapes.Worth Sharing.